Two of these mitzvot—challah and nidah—are prescribed by the Torah itself, while the third, the lighting of Shabbat candles is one of the seven commandments prescribed by the sages. In Hebrew, the first letter of the word for each of these mitzvot spells a name: Chanah. The first letter of “challah” is a chet, the first letter of “nidah” is a nun, and the first letter of “hadlakat haner” is a hei. Chanah is spelled: chet nun hei. Like in every word in Hebrew, the primary letter of Chanah is the first one, in our case the chet which stands for challah. So, we will begin by looking at the mitzvah of challah. Often in Kabbalah these three mitzvot are corresponded to particular holy vessels that were in the sanctuary.2 The lighting of Shabbat candles corresponds to the Menorah, the seven-candle candelabra that was lit every day in the sanctuary, and was located on its southern wall; the separation of challah corresponds to the Face-bread (lechem hapanim) that was baked once a week and placed on the Table of the Face-bread (shulchan hapanim), which was located on the northern wall, facing the Menorah. Nidah, the laws of family purity, correspond to the Altar of Incense (mizbe’ach haktoret). The Hebrew word for “incense” is k’toret. In Aramaic this word means “bond.” When Rabbi Shimon bar Yochai, the author of the Zohar, taught his students on his day of passing, he quoted the verse: “I am to my beloved and He yearns for me.”3 He then explained: “All the days that I have bonded, I have bonded singularly, with the Almighty, and now He yearns for me.”4 The “bond” between the Jewish people and G‑d that is created by the Altar of Incense corresponds to the singular bond created between husband and wife by the laws of family purity. These three vessels also correspond to the three emotional attributes, the sefirot of the heart: the Menorah corresponds to loving-kindness; the Table to might; and the altar of Incense to beauty, whose inner experience is one of mercy, or compassion (midat harachamim)—the ideal sentiment upon which to base marital relationships. One of the basic doctrines of Kabbalah taught by the Arizal is that everything has a source in a higher realm, which in practice acts as its inner essence, described as being enclothed within it. This is true of these three vessels and of their corresponding sefirot, whose source is in the intellectual sefirot: wisdom, understanding, and knowledge, which constitute the inner life-force of the soul: loving-kindness originates in wisdom, might originates in understanding, and beauty originates in knowledge. An illustration for these relationships can be found in the Amidah, the main part of Jewish liturgy. In the first benediction (b’racha) we say: “Blessed are You G‑d our Lord and the Lord of our forefathers; the Lord of Abraham, the Lord of Isaac, and the Lord of Jacob.” Each patriarch is the archetypal figure for one of the emotional faculties: Abraham for loving-kindness, Isaac for might, and Jacob for beauty. According to the syntax of this benediction (and as explained in the Talmud5), each one had a different conception of G‑d, which corresponds to each of their souls’ origin in the Almighty, just as each emotional faculty has a separate source in the intellectual faculties of the soul. So challah corresponds to might, and its inner source is in understanding. Since the sefirah of understanding in Kabbalah corresponds with the “mother principle” (partzuf Ima) we have another justification for identifying it as the most central of the three mitzvot for women discussed above. In addition, the numerical value of the word “Chanah” in Hebrew is 63, which is the filled value6 of the essential Name of G‑d, Havayah, which corresponds to the “mother principle.” As for the remaining two elements in this correspondence: family purity, or the “laws of nidah” clearly relate to the sefirah of knowledge, as knowledge is the source of the ability to connect and bond in the soul. The light given by candles in general and Shabbat candles in particular, is a metaphor for the sefirah of wisdom. Shabbat in general is identified in the teachings of the Arizal with the sefirah of wisdom, the experience of the light of new insight. Though G‑d’s essential Name, Havayah contains four letters (and is therefore sometimes called the Tetragrammaton) it has only three unique letters: yud, hei, and vav. Three unique letters can be arranged in six different permutations. Each of these permutations corresponds to and arouses one of the six sefirot of loving-kindness (chesed), might (gevurah), beauty (tiferet), victory (netzach), acknowledgment (hod), and foundation (yesod)—also called the six extensions of the heart. Let us look at the order in which women perform these three mitzvot in preparation for Shabbat—the ultimate manifestation of the feminine in the context of time. Challah is the first mitzvah done when the challah loaves for Shabbat are baked (as we shall see later on, there is a deep significance that the Shabbat bread has come to be known as “challah,” even though challah is taken from weekday bread as well), usually long before Shabbat (on Thursday night or Friday morning). Candle-lighting time is next, as the Shabbat candles must be lit before Shabbat. Finally, the holiness of family purity is revealed on the Shabbat eve, after the Shabbat meal. The order here is hei yud vav. Because it begins with a hei, we know that it corresponds to the left line of the sefirot. But this time it corresponds to the sefirah of hod, majesty and aura. This sefirah is strongly related with the first three words we say when waking up in the morning: “I acknowledge before you” (Modeh ani lefanecha) whose numerical value is equal to the numerical value of “woman” (isha), in Hebrew, as this is a feminine quality: the ability to acknowledge and give thanks for something. The Lubavitcher Rebbe explained, that in an extended way, the mitzvah of challah includes all the laws of keeping kosher (kashrut): feeding the whole family and guests. As explained in the Talmud, when the woman gives charity in the form of ready-to-eat-food, it is considered much greater than the monetary charity that her husband gives. This mitzvah is the essence of nutrition and nourishing the family. The mitzvah of separating challah in the Torah is found in five verses in the portion of Shlach Lecha (Numbers 15:17-21). Shlach Lecha is the 37th portion of the Torah. This portion begins with a recounting of the “transgression of the spies” (cheit hameraglim), which caused the nation of Israel to wander for 40 years in the desert instead of proceeding directly into the Land of Israel . As we shall see the mitzvah of challah is the primary rectification for the nation’s abandonment of the Land of Israel . Whereas challah is one of the three mitzvot dedicated for women, the final verses of this same Torah portion describe the This is a feminine quality: the ability to acknowledge and give thanks for something mitzvah of tzitzit13, which is the primary rectification for the men’s role in abandoning the Land of Israel (even though it is definitely permissible for a woman to wear tzitzit and there were many great women who did). Nonetheless, the Torah does not explicitly mention that challah is for women and tzitzit for men. In the oral Torah, i.e., the Mishnah, there is an entire tractate dedicated to the mitzvah of challah. From this tractate’s contents we will see that challah should indeed be strongly related with women and that it is connected to the Land of Israel and rectifying the Jewish people’s connection to the Land. 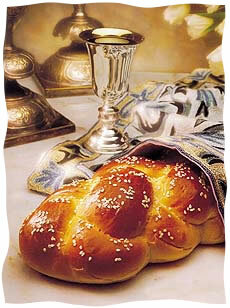 The tractate of Challah is in the first Order (seder) of the Mishnah, known as Seeds (Zera’im). In this Order, Challah is ninth of eleven tractates (the first is Blessings-berachot and the last is First Fruits-bikurim). This tractate only has Jerusalem Talmud to it but no Babylonian Talmud. The eleven tractates in this Order correspond to the sefirot from crown to kingdom, inclusive of knowledge. The first tractate, Berachot corresponds to crown. One of the topics central to the tractate of Berachot are the laws of Keriyat Shma, the essential Jewish statement of faith—faith being a super-conscious faculty located in the sefirah of crown. The tenth tractate of the Order, Orla (referring to fruit of a tree less than three years old), clearly relates to the sefirah of foundation, as the procreative organ upon which there is a human orla also corresponds to foundation. Finally, Challah is the ninth tractate, which corresponds to acknowledgment, the final feminine sefirah of the left axis. There is also a deep connection between acknowledgment and the body’s immune system, stressing the intrinsic relationship between acknowledgment’s feminine character and the immune system. For when one acknowledges the good inherent in everything and its potential ability, then one is able to combat the difficulties, to ward off impending illness, either physical or emotional. This is what challah accomplishes. And this is what the woman accomplishes through her acknowledgement. In this month’s (Adar I) readings in the Torah (parashot), especially the Torah portions of Terumah and Tetzaveh, we read of the commandment to construct the Tabernacle—the first instance of a sanctuary for the Almighty. Moreover, the Tabernacle and its vessels of service hold a special significance for women. The Tabernacle was tended by the priests, or, in the time of the wanderings in the desert by Aaron and his sons. Moses connected with God through the prophecy he heard as it came from between the cherubim seated on top of the Holy Ark. But, Aaron and his sons connected with God by their service in the Tabernacle. The priests’ holy duties in the Tabernacle were in many respects similar to the types of tasks every homemaker is responsible for, making them relatively feminine with respect to the duties of Moses. Today, every woman can take inspiration from the duties of the priests by realizing that every Jewish home can be and should be a sanctuary for the Infinite light of God. Based on a class given by Rabbi Yitzchak Ginsburgh. Edited by Moshe Genuth.